An imprint of Bloomsbury Publishing Plc. A superb publication, the sixth edition of Wisden India Almanack is meant for those who have passion for the game. 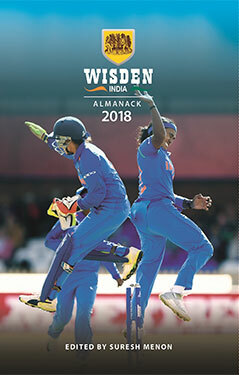 Wisden India Almanack 2018 is thoughtful, well organised and presented with all the professional attention to the fascinating minutiae that we have come to expect from John Wisden & Co and Bloomsbury Publishing India Pvt. Ltd. The excellent cover of Wisden India Almanack 2018 celebrates the women's team. Lokesh Rahul, Tamim Iqbal, Deepti Sharma, Ben Stokes, Priyank Panchal and Hasan Ali have been named as six Cricketers of the Year. Players can only be honoured once in their careers. Hall of Fame features Erapalli Prasanna and Shantha Rangaswamy. Bhagwat Chandrasekhar considers Prasanna a knowledgeable man, who has immense confidence and faith in his own ability. "Prasanna could do things with the cricket ball that few spinners can. There was his famous 'dip' which made batsmen look foolish as they searched for the delivery that appeared to be a half volley but landed a foot or so behind. He loved to see the batsman take a chance and hit him for six. In fact, he actually applauded such a shot. But, it was a trap. The next ball seemed to never arrive, and the batsman had to be extra careful. The cliche about Prasanna's bowling, that he seemed to have the ball at the end of an invisible string which he pulled at will, was born with such deliveries. Summing up the first decade of the IPL, Nisha Shetty believes IPL is full of contradictions. "It's why Rajasthan, the team billed as no-hopers in the first edition of 2007, ended up as the champions. It's why Royal Challengers Bangalore, a team that boasts of some of the biggest names in international cricket such as Virat Kohli, AB de Villiers and Chris Gayle, have never won once." The Almanack has paid a grand tribute to the Indian Women's team for reaching the finals of the Women's World Cup 2017 in England. In a piece, namely, The World is watching, Karunya has remarked: "The Women's World Cup 2017, in all its broadcast - or at least live-stream - glory, introduced millions in the mainstream to a fact followers of Indian women's cricket knew for a while: Raj and Goswami are institutions, and so much about them, as players and as persons, is unique. It is a pity that they had to wait till so late in their careers for their country to really see who they are - how much they have missed, simply because there wasn't a camera turned in their direction for so many of these years? But it is also a wonderful that now, finally they, and the women's game, are getting the attention and adulation they deserve." She hails Harmanpreet Kaur's unbeaten 115-ball-171 in that semifinal win over Australia at County Ground, Derby on July 20 as the greatest ODI innings by an Indian that "changed the profile of women's cricket in the nation watching back home." In his editorial notes, Suresh Menon believes Kohli's support of Test cricket, his insistence on fitness, his positive attitude are all good for Indian cricket. His legacy will be decided by what he does in the next couple of years. As captain and the side's best batsman, he is already the statistician's delight; if India do well abroad, he will become history's darling too. India's one significant loss, according to Menon, was in the Champions Trophy final to a young, hungry, passionate Pakistan who only just made it into the tournament as the eighth-ranked team. They had more to prove. For close to a decade, a generation has grown up without having seen their heroes in action at home. To retain the passion, the vision, and channelise the anger and disappointment has been Pakistan's great achievement. They played on the edge of the tournament, almost every match a knockout, but remained, the last men standing. All international series have been covered apart from a separate Records' section, covering Tests, ODIs, Twenty20 Internationals, First-class and Women's Cricket. All in all, a most stimulating book, which no lover of the game should be without. The feature of the book is its outstanding photographs, taking it to another level of excellence. An indispensable companion at the game.